Origin = usually the end of the muscle attached to the bone that doesn’t move. Insertion = usually the end of the muscle that’s attached to the bone that moves. 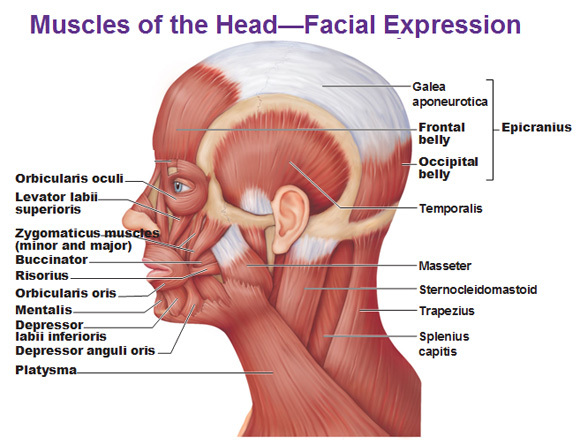 The muscles of the face are very unusual cause they don’t move bone but skin. 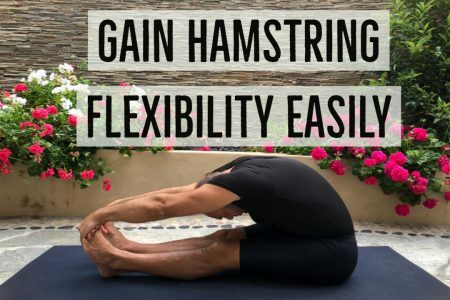 The muscles connect to the skin and other muscles. The occipitofrontalis is also known as the epicranius. It’s very obvious in its name as the occipital belly covers the occipital bone and the frontal belly covers the frontal bone. This muscle has two bellies and this is an unusual muscle not only because of that but it is connected by a giant tendon called the aponeurotica which covers the top of your skull. This is the muscle that helps you raise eye brows and anchor the aponeurosis. The origin of the frontal belly is the aponeurotica and the insertion is the skin of the eye brows. 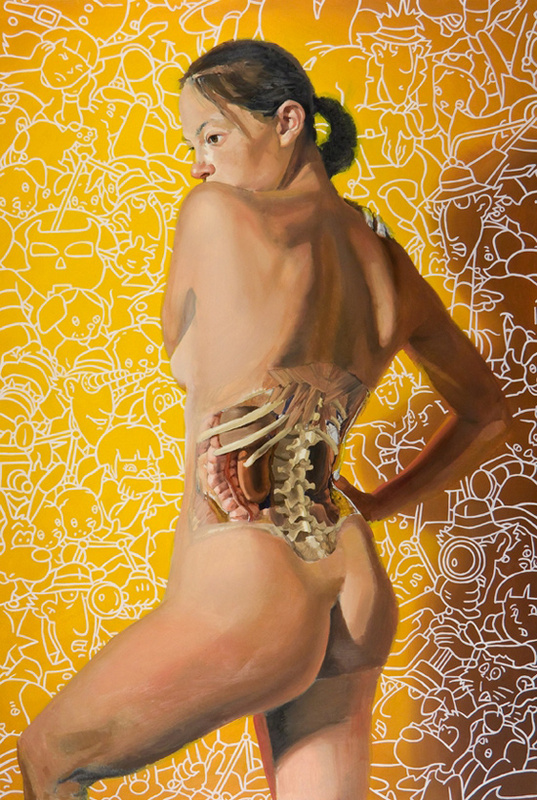 The origin of the occipital belly is the occipital bone while the insertion is the aponeurotica. 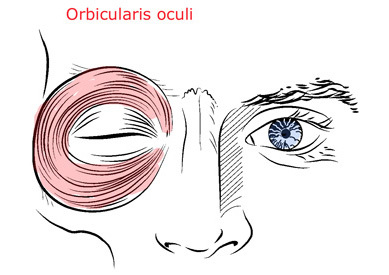 Orbicularis means circular muscle and oculi means eye. This is a circular (sphincter) muscle that goes around the eye. Fibers anchor the frontal bone and maxillary bone and inserts into the eyelid so that when it contracts it closes the eye. 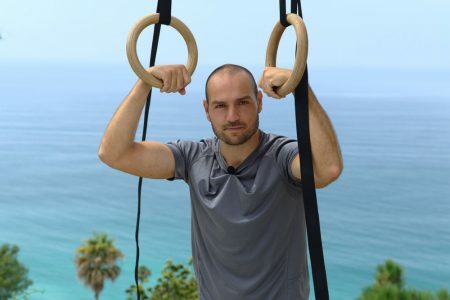 When this sphincter muscle contracts, your eye lids close. 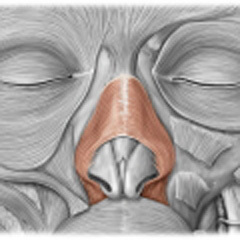 The nasalis muscle is what helps you flare your nostrils and “depress the bridge of the nose.” The origin is the maxilla and the insertion is the dorsum of the nose which is literally the top of the bone. The origin is the zygomatic bone (the cheek bone!) and it inserts into the skin and muscle at the corner of the mouth so when it contracts it is what literally lifts the corners of your mouth to help you smile. Or in other words it lifts the corners of your mouth superiorly and posteriorly. When the risorius muscle contracts, it draws the corners of the mouth horizontally/laterally and creates the insincere/fake smile because it doesn’t involve the skin around the eyes. 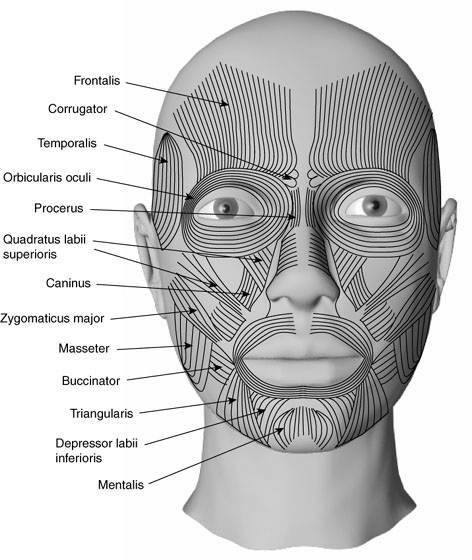 If you were to do a real smile, you would contract the zygomaticus muscles which connect up near your orbicularis oculi muscles and create “crows feet” around the eyes. 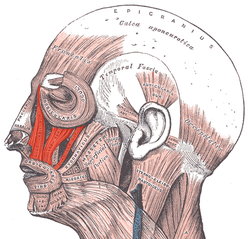 This is the horizontal muscle whose origin is the fascia of the masseter muscle and it inserts into the corner of the mouth. This lowers the lips of the mouth and is usually used during frowning or making a sad face. The origin is the body of the mandible (the chin) and the insertion is the skin/muscle at the corner of the mouth. Levator = Lifting/elevate, Labii=Lip, Superioris = Upper… so this is the muscle that lifts the upper lip. Its origin is the zygomatic bone and its insertion is the the upper lip. This is what lowers (depresses) the lower (inferioris) lip (labii). The origin of this is the body of the mandible and the insertion is the skin/muscle of the lower lip. Note the triangularis/depressor anguli oris insertion is at the corner of the mouth while the depressor labii inferioris is more medial. Again we see this word orbicularis (circular) but instead of oculi, it’s oris, which means mouth. It is not a sphincter muscle, it only gives the appearance of one, it is actually made of a four independent quadrants of muscles. The origin of this is basically all the muscles of the mouth that cover the maxilla and mandible away from the mouth and the insertion is the skin and muscle around the mouth. This one is easy, the mentum = chin in latin, so the mentalis is located at the tip of the chin. It raises and pushes up the lower lip, causing wrinkling of the chin, as in doubt or displeasure. It is sometimes referred to as the “pouting muscle.” The origin is the mandible (on either side of the midline) and the insertion is the skin of the chin. 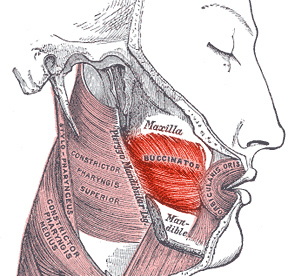 The buccinator, sounds funny, and it is a funny sounding word. It’s latin origin means “trumpeter” and it is the muscle in the cheeks near the 3 molars that helps keep the food in between the teeth by flattening the cheek agains the teeth while chewing. The origin is the maxilla and mandible, the alveolar margins near the molars and the insertion is the orbicularis oris. This is a superficial muscle that tightens the neck, helps lower the jaw, helps draw down the lower lip and angle of the mouth during grimacing/melancholy expression as it hits the corner of the mouth. The platysma’s origin is the fascia of the chest and goes inserts into the lower margin of the mandible, skin and muscle at corners of the mouth. 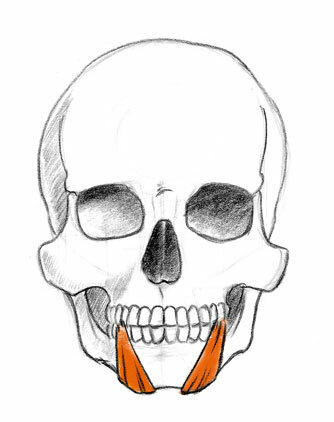 The origin of hte masseter muscle is the zygomatic arch and it goes down to the angle of the mandible. This is what closes your jaw. Temporalis is named that because it originates from the temporal fossa, in the squamous part, of the temporal bone. The insertion is at the coronoid process of the mandible. 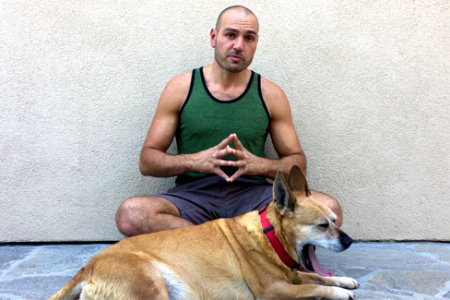 This also allows you to close your jaw and also maintains a resting position for the mandible. The more horizontal posterior fibers are what help retract the jaw. Already mentioned this above, the one that keeps the cheeks flat and keeps the food between the teeth. Intrinsic muscles of the tongue form the tongue itself while the 4 extrinsic muscles move the tongue around.